A new quantum computer module combines proven techniques with advances in hardware and software. But these laboratory devices are often hard-wired to run one program or limited to fixed patterns of interactions between their quantum constituents. Making a quantum computer that can run arbitrary algorithms requires the right kind of physical system and a suite of programming tools. Atomic ions, confined by fields from nearby electrodes, are among the most promising platforms for meeting these needs. 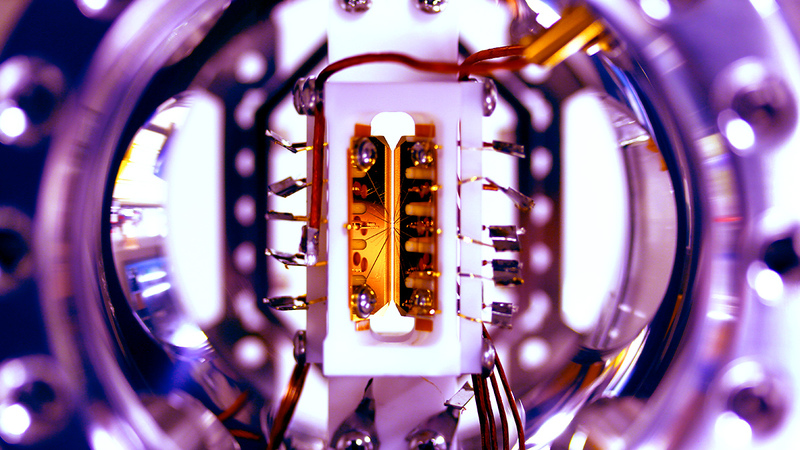 In a paper published as the cover story in Nature on August 4, researchers working with Christopher Monroe, a Fellow of the Joint Quantum Institute and the Joint Center for Quantum Information and Computer Science at the University of Maryland, introduced the first fully programmable and reconfigurable quantum computer module. The new device, dubbed a module because of its potential to connect with copies of itself, takes advantage of the unique properties offered by trapped ions to run any algorithm on five quantum bits, or qubits—the fundamental unit of information in a quantum computer.